The addition of ROUSH TVS 2300 supercharger system bulks up power to 600 hp in the new 2016 ROUSH F-150. The pre-title 2016 ROUSH F-150 SC is now available for purchase at ROUSH dealerships in federal emissions states not governed by the California Air Resources Board (CARB) regulations. The 2016 ROUSH F-150 SC is about high performance – whether it’s on the road, the track, or off the beaten path. On- and off-road power make the new 2016 ROUSH F-150 SC from ROUSH Performance the next evolution in high-performance truck technology. The 2016 ROUSH F-150 SC comes with a robust 5.0L V8 engine from the factory, but the addition of the ROUSH TVS 2300 supercharger system bulks up power ratings to an aggressive 600 hp and 557 lb-ft of torque. The pre-title 2016 ROUSH F-150 SC is now available for purchase at ROUSH dealerships in federal emissions states not governed by the California Air Resources Board (CARB) regulations. It comes with an industry-leading three-year, 36,000-mile limited warranty. A ROUSH/Fox 2.0 Performance Series Suspension System, featuring front coil-overs and rear shocks with boots, means the 2016 ROUSH F-150 SC is as tough and nimble off-road as it is on-road. ROUSH 20-inch wheels with beefy Mickey Thompson Baja ATZP3 305/55 tires give the truck a stance that’s second to none. A ROUSH Performance Side-Exit Exhaust System makes the 2016 ROUSH F-150 SC rumble no matter where it’s driven. The ROUSH TVS 2300 supercharger system includes Eaton’s new TVS (Twin Vortices Series) Technology, which features twin four-lobe rotors twisted to 160 degrees. When applied to the 2016 ROUSH F-150 SC, it increases horsepower by 56 percent over stock (+215 hp) and torque by 44 percent (+170 lb-ft). The 2016 ROUSH F-150 SC also sets a high standard when it comes to appearance. 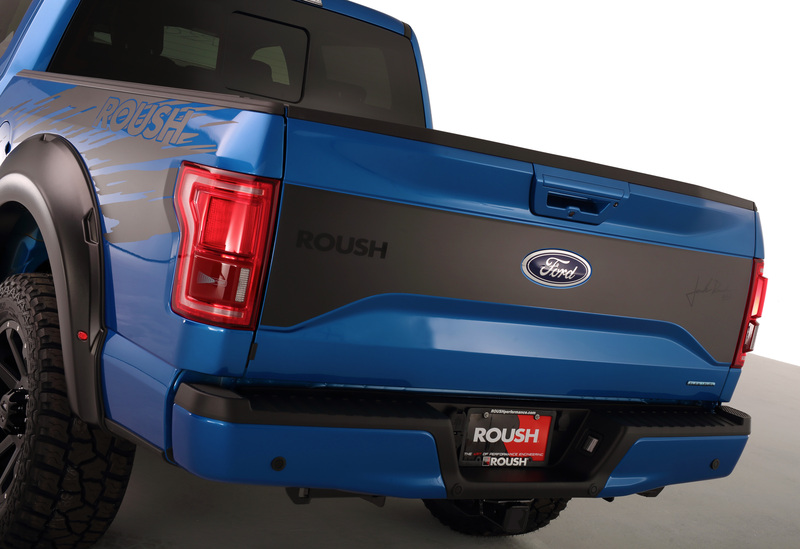 ROUSH exterior components include front grille and fender flares, both with clearance lighting; front bumper cover; square “R” hitch cover; and license plate and frame. The package also includes a full ROUSH graphics package, including hood, front windshield, side rocker and tailgate graphics. Additional options include a splash-style graphic. For more information about the 2016 ROUSH F-150 SC, contact ROUSH Performance at 800.597.6874, visit its website at ROUSHperformance.com, or visit your local ROUSH dealership. Based in Plymouth Township, Michigan, ROUSH Performance was founded in 1995 by motorsports legend Jack Roush. A ROUSH/Fox 2.0 Performance Series Suspension System, featuring front coil-overs and rear shocks with boots, means the 2016 ROUSH F-150 SC is as tough and nimble off-road as it is on-road. 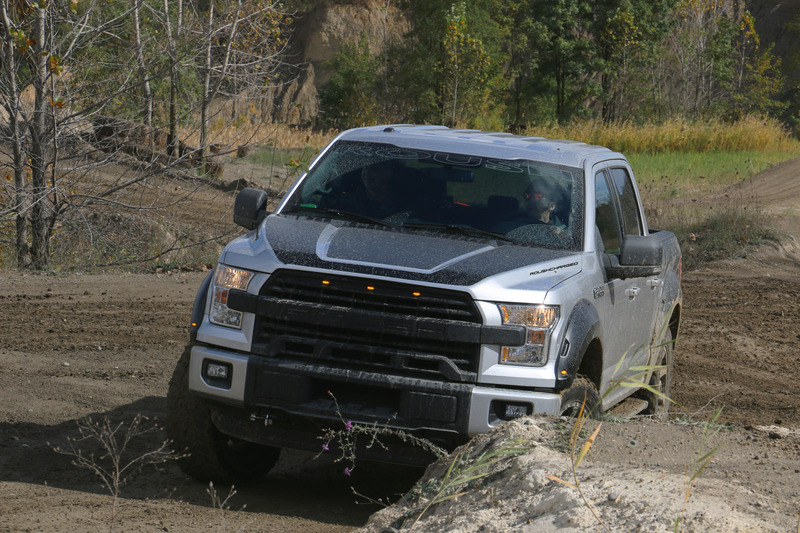 The 2016 ROUSH F-150 Supercharge exterior components include front grille and fender flares, both with clearance lighting; front bumper cover; square “R” hitch cover; and license plate and frame.